COME OUT AND JOIN US THIS SATURDAY FOR ROCK THE RIVER! 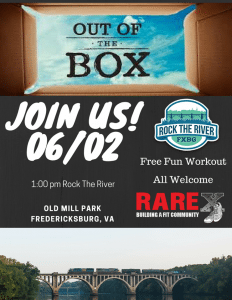 Fusion Physical Therapy as well as RARE Crossfit will be at Fredericksburg Rock the River this Saturday. This is a wonderful community celebration to kick off the summer. If you see us come by and say hi! Check out ROCK THE RIVER for more information!